We’ve had blueberries sitting in our freezer for over a month now from when we went blueberry picking so yesterday when I was craving crepes, I decided to make crepes filled with a blueberry sauces, topped with powdered sugar and whipped cream. I know these are not the healthiest, but boy were they delicious! Tyler usually sticks with cereal or waffles for the morning, but he decided to give them a try and soon found out how yummy they were. He even snuck a second one when I went to clean up the dishes. In a small saucepan whisk together blueberries, lemon juice, and sugar. Bring to a boil for 1 minute. Whisk in cornstarch and boil for 1 additional minute. Serve warm or cooled. - Great for crepes, pancakes or waffles. In a large mixing bowl, whisk together the eggs and milk, then gradually add in the flour, sugar and salt; beat until smooth. I have found that using an electric mixer for about 30-45 seconds blends it a lot easier and quicker. Heat a lightly oiled or buttered frying pan over medium heat. Pour or scoop about 1/3 cup of the batter onto the griddle. Tilt the pan with a circular motion if needed so that the batter coats the surface evenly. Cook the crepe for about 1- 1 1/2 minutes until the bottom is light brown. Loosen with a spatula, turn over and cook the other side for 1 minute. Serve with your choice of fillings/toppings. We still have a whole zip-lock filled with fresh blueberries so I’m thinking next week we’ll have Belgium waffles covered in Blueberry Sauce. Yum! I love crepes! Thank you for the recipe! Crepes are one of my favorite splurge breakfasts! I love blueberrys, thanks for sharing! This looks delicious! I’ve never actually made these before but it looks pretty easy. I’ll give it a try! I usually eat pastries in the morning, I think this will be great. never tried it before and will be trying this. 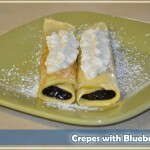 Crepes With Blueberry Sauce looks so delicious. I never made crepes myself, only had them in restaurants. I guess I should try this, I would enjoy it. I haven’t ever had crepes before…. to be honest I was completely sure what they were. Will have to give these a try… they sound delicious! These crepes look so tasty!! I love the blueberry sauce! That sounds delicious and easy.Thanks for sharing! These sound wonderful! 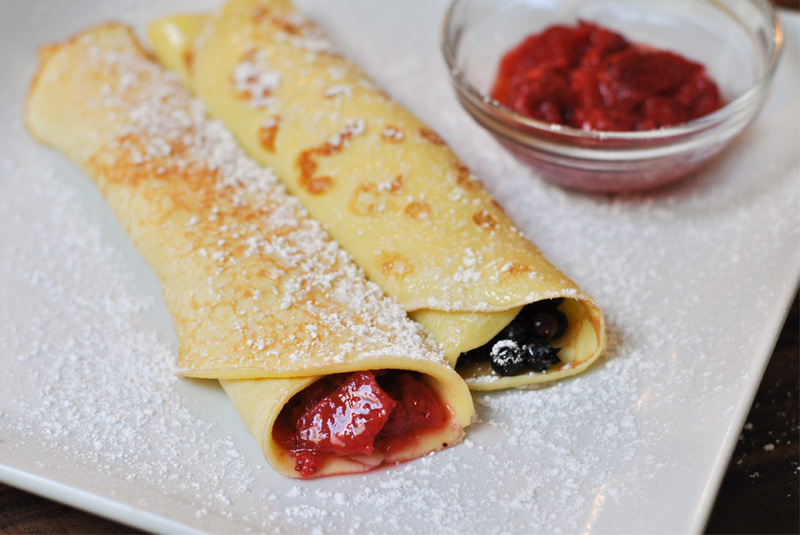 I love crepes and this would be great with any fruit- goodness peacjes sounds yummy right now. I have been looking for a good crepe recipe for quite sometime now. I wanted something fairly easy and not with a whole ton of ingredients. This is a wonderful recipe. Thanks for sharing it with your readers. 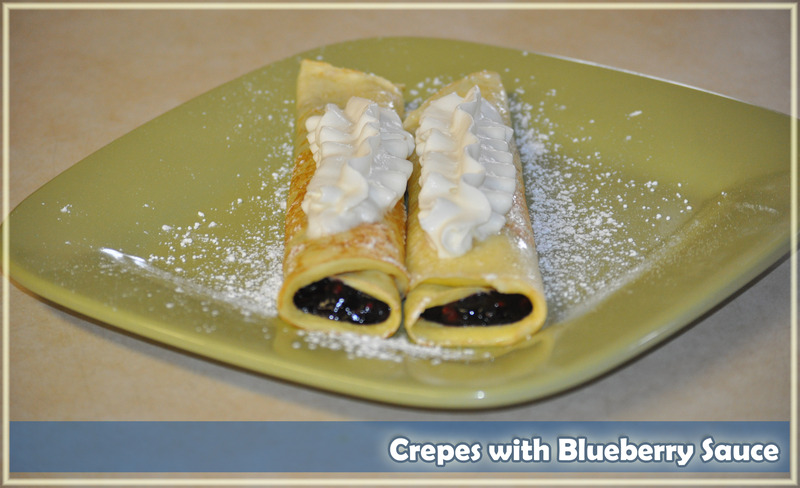 I have been wanting to make crepes and this is a wonderful crepe recipe using blueberries. I like that it is easy to make and a nice light dessert in the Summer. Thanks for this recipe! Great tasty recipe. I have started to learn to cook and crepes would be a delicious breakfast or dessert. Love eating something that feels fancy! I love crepes! This recipe looks quite delicious and you can’t go wrong with blueberries! I would enjoy making this. I have already wanted to try to make these but I didn’t think I could but this recipe sounds like one I can actually do thanks for posting this one. I love crepes althugh have never made them. These look so good can I coe over? 🙂 I need to try these! How fun. I get these at Ihop. I love crepes!! The blueberry sauce just adds more flavor to them!! Crepes always make me nervous as a cook — they look so delicate! Maybe this recipe will give me the courage to try them! These would be a perfect addition to a spring brunch! I’ve made pancakes so often, it has never occurred to me to try crepes – these look so good that is about to change. I love this blueberry sauce, too! I love blueberries. These look delicious!